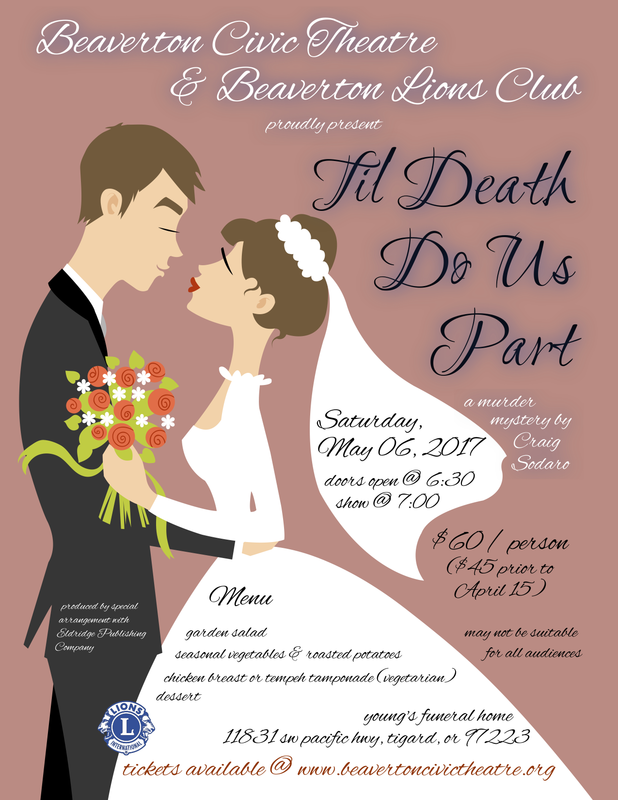 Join us for a murder mystery dinner theatre event! The menu includes a garden salad, roasted garlic seasonal vegetables & herb roasted oven potatoes, a choice of rosemary thyme grilled chicken breast or tempeh tamponade, and a slice of the wedding cake! Catering provided by Simply Thyme Catering. You are invited to the most offbeat wedding of the season, where murder takes center stage and all the guests are suspects. Herb and Eula Lomax don’t really approve of their zookeeper son marrying Lotus Blossom, an herbologist, because they think she’s after their money. Newton Figg doesn’t want Blossom to marry Leo because Newton’s still in love with her. Of course Newton’s new date, the bubble-headed Lulu, doesn’t catch on too quickly. Howard, the Lomax family lawyer, has a little something up his sleeve as well. It might involve the mysterious guest who calls herself Aunt Hildy. Unfortunately, Aunt Hildy dies mysteriously before revealing whose aunt she really is! When the lawyer, Howard, is also murdered, amateur sleuth Miss Peabody, takes charge and conducts an investigation punctuated by the traditional wedding events such as the throwing of the bouquet, the cutting of the cake, and the happy couple’s first dance. But each moment brings Miss Peabody a step closer to the identity of a ruthless killer consumed by greed. Is it one of the bridesmaids? A suave tango instructor? The grandmother of the bride? The corny cousin from Big D? The Justice of the Peace? With the help of the audience, all but the killer (well, and the bodies) will live happily ever after.